Have you ever come across a website and wondered what language the site was written in? Or found a great site but could not read what was being said because of some unknown signs used? Or maybe a document or email that arrived in a language that you can't identify? The Lextek Language Identifier can help you in this case. The freeware is able to detect more than 260 different language and encoding modules. Usage is simple as well, you copy and paste the text into the language identifier window and press the identify language button. The analyzer will analyze the test and display what it believes to be the language used in the text, as well as other possible languages it could be.I presume this is to avoid errors when the reported used language is not the right one, never experienced that case though but since words may be part of multiple languages, it is a good idea to cover all bases. The program starts up fine after installation, even on newer Microsoft operating systems like a 64-bit version of Microsoft Windows 7, 8, or 10. First thing that you need to do is to load one, multiple or all languages into the program. These languages are then used in the language identification process. You do that with a click on the "open language" or "open all languages" button in the program interface. 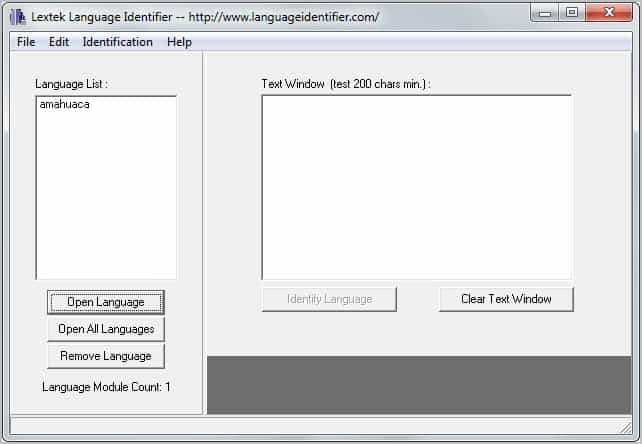 Once you have added at least one language to the interface you can start adding text to the window. This can be done by either typing the text in directly, or by copying or pasting text into the window. Please note that you need to enter at least 200 characters into the window so that text can be identified properly. Just click on the Identify Language button once you have stopped adding text to run the language identifier. The program will then display the language the text is written in in its interface. You can also clear the text to start anew by clicking on the "clear text window" button. Language Identifier is a useful program even in times where Google Translate and other translation servers are available in abundance. Most services require an Internet connection and while some provide offline capabilities, it is often necessary to download language packs for it to work. This program does not require an Internet connection to do its work, and it won't sent the text to any third-party site or service either which is another benefit that it offers over translation services and applications.